Best for: All Preperation time: 45 mins. 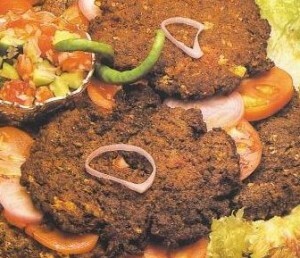 Chapli Kababs recipe by Samar Junaid at DesiRecipes.com. Green chillies (chopped) 6 nos. First of all wash qeema and drain, to take out all the water. Then add all the above ingredients except fried eggs and cornflour. Then add the fried eggs, cornflour and mix throughly. Keep in the fridge for atleast an hour. Make medium flat patties and fry in oil at medium flame until they turn brown from both sides. Serve hot with hot naan or roti. i jst lov chapli kabab.. its really easy recipe you provided..